Love the look! So cute and classy! Today I'm wearing a Denim on denim outfit with amazing animal print heels. love this look. so pretty. yellow suits you so well. This is such a cute outfit! I'm obsessed with that skirt, it's literally my favorite shape. Gorgeous as always! Love your skirt and sunnies! Oh gorgeous look, loving that skirt, and your sense of styling. Ooh I love these kind of skirts, just fab! Woow! I like the sunglasses and..
love your outfit. The top and the skirt match perfectly together. Love the colors and of course your amazing jewelery. So cute, you definitely remind me of the pretty blonde in Mad Men here! 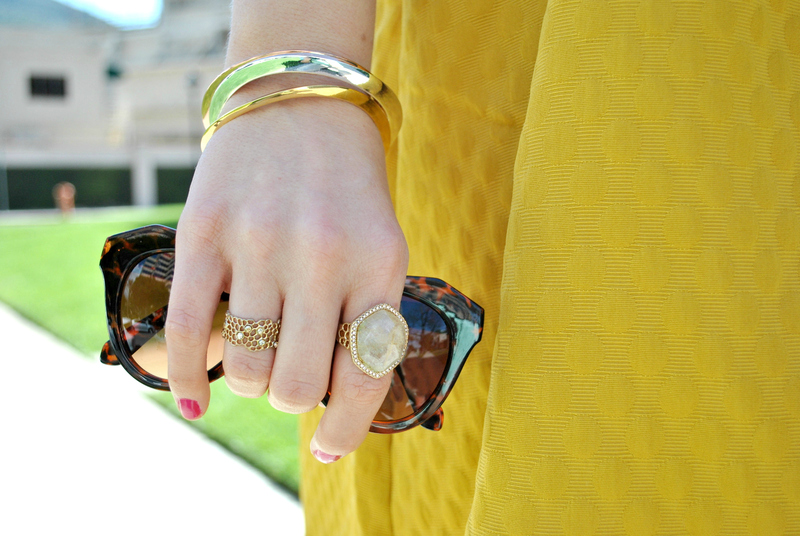 Love this skirt and great jewels. Adore the silhouette of your skirt. Oh wow! Super gorgeous and so feminine. You're just like a real life Barbie Doll. the skirt looks really cute ! Loving this skirt on you . You can never go wrong with a stripy t-shirt! Beautiful post!!!! Today in my blog Urban Camouflage. Visit my blog!!! This is adorable, I love the vintage inspired yellow skirt! wow!! great skirt! looks so nice on you and goes very well with the striped top!! happy week! Love the accessories! The necklace is amazing! Lovely outfit! 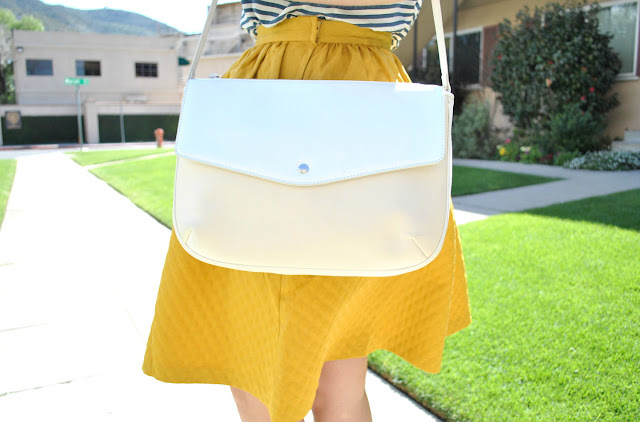 So summery and cute! 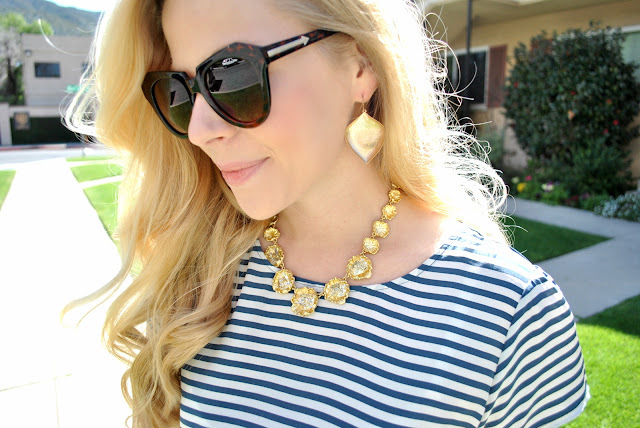 I always love the versatility of a great navy striped shirt...great look! I love your outfit, and especially the shirt! Love this outfit especially the skirt. Saw it in white and wanted to buy, but it sold out way too quickly! Oh my gosh, I NEED that yellow skirt! Love this entire look! So pretty! I love the fullness of your skirt and the simplicity yet perfection of this outfit! You look so pretty, like always. Loving the skirt! This outfit is awesome. I love the full skirt, and all the sparkly gold jewellery. I am loving that skirt!! Love that skirt. Such a cute outfit Anna! Obsessed with this outfit, Anna. The jewelry is gorg. Ahhhh. This skirt is ammmmmmmmmmazing!!! Love the vintage feel. I could see Taylor Swift wearing this outfit in a heartbeat. Love this skirt on you. The color is so pretty. Gorgeous! Hi Anna, Love the fullness and color of your skirt. Beautiful pictures and outfit. If you get a sec, check out my latest post 'Casual Meets Chic'. I would love to hear what you think of my new tweed skirt and how I styled it. One of my favorites. You look stunning. Great post- the pictures are so cute and happy :) I love the pop of mustardy yellow too. It's really pretty. Your post has genuinely made me very excited for the Summer (hurry up!) :) haha! So cute!! I love how bright and full the skirt is! That top is smashing. So lovely. the skirt is super pretty! love it! the skirt is so cute! the top is gorgeous! i am obsessing over the new paper crown collection. if the savannah dress randomly appeared in my closet, i don't think i would ever take it off until it fell to pieces. not even joking. This look really reminds of jcrew because of the colors and the statement necklace with stripes. Hey sunny, you look great - this skirt is awesome! Absolutely gorgeous, I would so wear this look! I want those wedges. Great addition. Your accessories always blow me away. I'd love to see a picture of your whole collection. Great pots!! Beautiful outfit. I love the necklace. The bright yellow makes me think of sunshine and Spring. Extra cute! Love the classic look of the skirt! This is such a fun outfit! 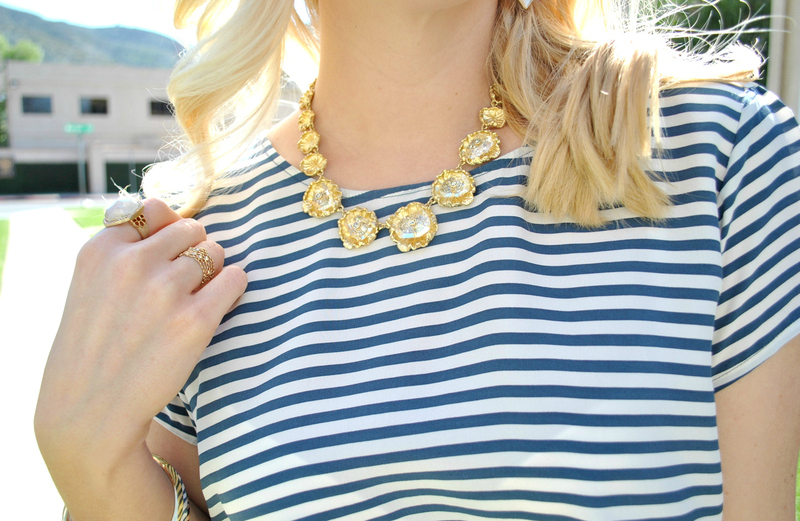 I love yellow and stripes paired together! Love your vintage inspired look - so cute! 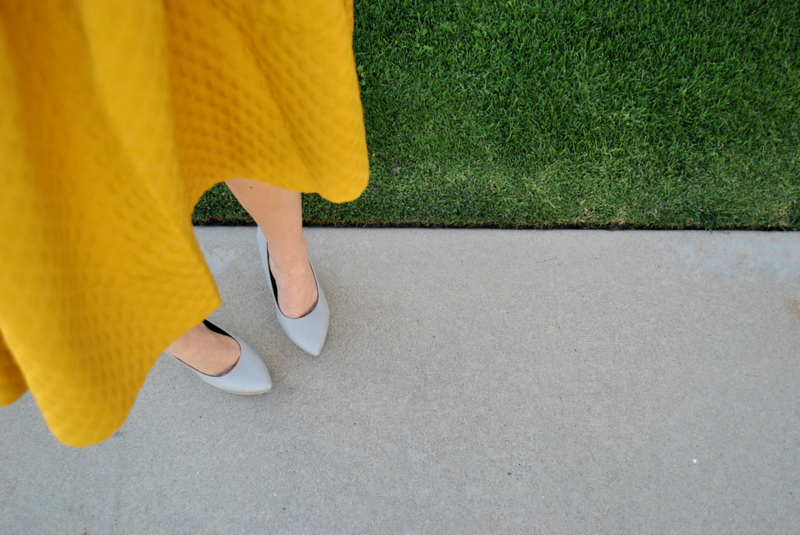 We love your full skirt and your awesome flats! You look great. Also, thank you for visiting and commenting on our blog. You really made us blush! Thanks for being so sweet Anna. You look great in a full skirt! So... housewife ;) Also, loving the detail on your sunnies! Love the full skirt... so charming! Gorgeous look! I just love the skirt and your pumps! Love that skirt. Love. The mustard and blue are becoming one of my favorite color schemes. Pretty skirt! Love the jewelery too! This is gorgeous! The stripes with a textured mustard skirt are just too perfect. Feeling inspired by this! I love this outfit and I am a huge fan of full skirts. Great look! Love this look! The skirt is gorgeous, paired with the stripes and jewellery it's perfect! OMG! You look stunning!! This outfit is so fun!! I love the skirt and the striped shirt is perfect!! Very chic my dear!! I absolutely love the shape and color of this skirt! Looks amazing on you!